If you are looking for information on the Liberty Weight Loss franchise business opportunity, Liberty Weightloss franchises or Liberty Weight Loss Center franchising, then you have come to the right place. Liberty Weight Loss Centers is a recognized leader in the weight loss industry. We have developed effective weight loss programs that have helped hundreds of people shed pounds and inches. Our diet programs are developed from nutritional principles, which are easy to follow and proven to produce successful results. Every Liberty Weight Loss Center franchisee will receive an exclusive geographic territory in which to operate. Your territory will represent your local community, which means you'll already know many of your clients when you open your doors. become involved in the weight loss industry. 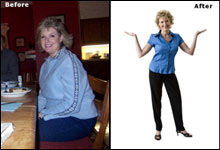 "After six years of carrying almost 30 extra pounds, I discovered Liberty Weight Loss. Now at age 48, I'm in the best shape of my life. I'm keeping the weight off because I've learned portion control and how to make smart food choices. Plus exercise is something I enjoy now. I really like the way my clothes fit and the way my husband compliments my lean look. Joining Liberty Weight Loss is one of the best decisions I've ever made!" "I looked at numerous businesses and became an Area Developer because Liberty Weight Loss was the right fit. I liked the multiple revenue streams and high consumer demands, not to mention the ability to grow a large business, make a difference and get results for lots of great people." Would you like to own a business that benefits you while making life changing impacts on the customers you serve? Approximately two thirds of adults in the United States are considered to be overweight driving the weight loss industry to well over 46 billion dollars. Women make up the majority of this market as consumers of weight loss related products and services; especially, women between the ages of 30-65, which includes the lucrative baby boomer population. Liberty Weight Loss offers plans for both men and women. The best way to healthy weight loss is through a well balanced food plan, one on one counseling and taking the right supplements. If doing this alone was easy, no one would ever have a weight challenge. To succeed, people need help and support. Both unit and area development locations are still available. Ask about our Veteran Discount!